"Amazon.com" has this book. 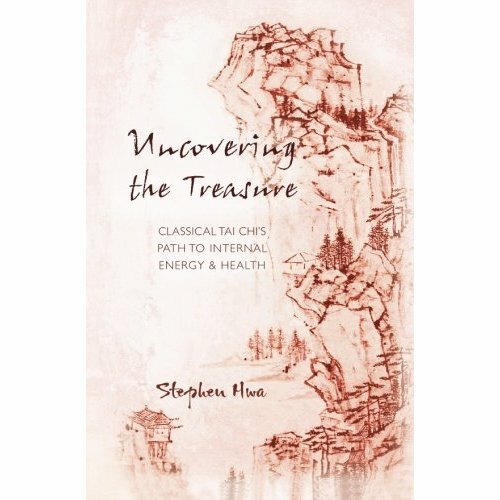 Type in the name Stephen Hwa in their search field. Modern Tai Chi teaching has been shrouded in ethereal language as if logical thinking and scientific analysis do not apply to Tai Chi. Without a rational framework, Tai Chi practice has degenerated into multitudes of forms varying from a slow dancing exercise to tight fisted, muscle-bulging external martial exercise. Many of them contain harmful movements. In the long term, these movements will cause problem for the practitioner rather than improve their health. The rational and scientific discourse presented in this book enables readers to have a different perspective and mindset about Tai Chi from what is preached today. Readers will acquire sufficient knowledge here to be able to critically evaluate what is beneficial and what should be avoided. This book is a distillation of the Wu style teaching from Young Wabu (student of Wu Chien Chuan) and thirty five years of discovery through practicing and teaching by Master Stephen Hwa. It offers personal experience and insight into Master Hwa's road of discovery. Much of the information is spread throughout Master Hwa's DVD series, his webpage, and his Forum. He reorganized the information so that the multitude of topics in Tai Chi, such as internal energy or internal power, Large Frame Form, Compact Form, Square Form, body posture, Fajin, Qi Gong, Silk Reeling exercise, martial art applications, health benefits, and etc. fit into a concise and easy to understand format. In conjunction with the Classical Tai Chi DVD series, this road is open to anyone who sets their mind to travel it. I have another letter and response from my teacher Master Stephen Hwa. It is in the same tenor as the previous blog wherein I attempt to address the concerns of students who are interested in martial applications, push hands, etc. My thesis holds true: Without substantial training of internal discipline, there is no point in pursuing push hands, applications, etc. Without understanding of the principles behind the 13 methods, postures, movements, there will be no understanding to be had for students who begin push hands, etc., prematurely. Of course this has not stopped many from ignoring this advice, I do not address this to them, what point in arguing or debate...they don't care to understand internal. Hope the recent trip to the mainland was fruitful and that air travel remained healthy. This has puzzled me since we made "Tao of M.A.". In the DVD you refer to the word "Bing or Peng" as "push". This push you go on to say is either "high" or "middle" which is also known as "one inch punch". I agree whoever it was who said that discussions of Peng are like trying to talk about any color, red, yellow, etc. It will make no sense unless one can give specific examples. 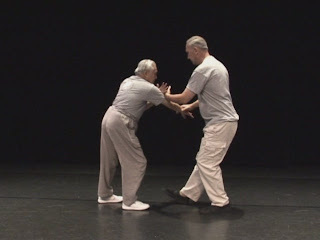 As I said in the previous blog as well, the Tai Chi Classics have no tutelage on how to do Peng, Lu, Ji, etc. and of course reading what someone from another style has written most often is interpretation from an "external" point of view, not "internal". Peng is often thought of as the application ""ward off" in push hands, etc., it is not "ward off", Peng is merely an intrinsic quality of the application "ward off". People engage in this much the way people say "tingling fingers" are Qi. "Tingling fingers" are not Qi, they are evidence of Qi, much the same way a "red", lit, light bulb is not electricity. Peng is referred to in the Tai Chi Classics as a "spring like" energy, this quality of "spring like" is present in all the other "methods", Lu, Ji, etc. This "spring like" quality sounds remarkably like internal energy which is generated through internal discipline in movement. It is a necessary but not sufficient quality to performing any of the other methods correctly. Hence, one cannot say they uprooted an opponent using "Cai" or "Tsai" (pick, pull, pluck) if the quality of Peng was not present as well. Peng as any application is not a valid quality in for example "ward off" if external force, eg. pushing with legs, extraneous movement at shoulder, disconnect at shoulder, tension in arms, etc. Peng has an intrinsic "rising" quality that is only generated correctly from using internal discipline. The "rising" is referred to in Tai Chi Classics as analagous to "water supporting a boat", etc. I think you referred to this before as Intrinsic "upward quality" that things like "quarter body movement" can induce. Example being, I do one inch punch and I feel that my arm, palm, fist, kind of spontaneously goes upward. Peng as quality of say "ward off" is also rather expansive. It seems to originate at my core and seems to "fill" me up like a tire. When I ward off an opponent (hold them away from me) Peng is in direct line with them, when I move forward, Peng rises at where I touch them, it goes up. I use less force than he does but once he is off balance, I can add more. So Peng has these Yin and Yang qualities however dependent on the quality of one's internal energy. Peng with such Yin and Yang in consideration can keep an opponent from getting to my core and as such is basis for any abilities I have with "Ting Jin". If my arm is too tense for example, I cannot have quality of Peng, since I cannot "ting jin" the opponent. I simply am too tense, therefore cannot "sense" what opponent is doing. Conversely, Peng can with Yang in consideration be essential quality of "one inch punch" and as such have that "rising" quality even in the burst of power. Hi Jim: What you said about Peng is very correct. Especially the upward motion is an excellent observation. I discuss that in the book as you will see. I am the son of one of your students and I am a graduate physical therapy student at Ithaca College and I am currently taking a class called Wellness and Prevention. One of my assignments in this class is to interview an instructor of an alternative medicine/exercise field of study. I remember my father talking to me about the benefits that your Tai Chi instruction has provided him and I immediately thought that an interview with you might provide me with a new and interesting outlook on a different form of wellness. If you could help me out by answering a few questions regarding your field of Tai Chi, I would be greatly appreciative. The interview has to be handed in on Friday so I would be extra appreciative if you could respond to this by thursday night. If time constraints or your schedule do not allow this, I understand and would appreciate a response just so I can know to look elsewhere for another interview. The questions are as follows:1. How did you first begin practicing Tai Chi? Was there a specific event causing you to begin practicing Tai Chi? 2. After many years of practicing, what is your most valued benefit in terms of wellness?Have there been any negatives to practicing Tai Chi, if so what is the largest? 3. What do you hope that those who take your classes will gain from the experience? I first began practicing Tai Chi in 1976. The Taoist Tai Chi Society was the first location in the U.S., and the Yellow Pages provided me with the address. I thought that all Tai Chi was the same in those days and by the same I mean at least similar to why I was motivated to study. I was motivated to study after reading "Comprehensive Asian Fighting Arts by Donn Draeger and Robert W. Smith. Smith was a former CIA agent that ended up studying Tai Chi in Taiwan. I left the "Taoists" after 2 years and studied Yang Style for awhile with a Chinese Family in Toronto, then on to Wu Style with Wu Kwong Yu in Toronto, and finally with Stephen Hwa Ph.D. in Rochester, NY. The book describes what I would call the fatuous and fantastic in terms of martial arts and Tai Chi is no exception. However, Tai Chi is described as having an "internal" component or "qi" (chee) which as the book describes in the case of the 18th and 19th century masters in China was used to great advantage in both fighting and for health. I'll let you read some of what is said for yourself, click here: Tai Chi. There was no specific event, except that I had started Shorin Ryu Karate while in the Marine Corps and always maintained a great interest in the martial arts. I am pretty sure the enormous ego I had at the time had quite a bit to do with why I got into things such as Tai Chi as well. That's ok, ego brings us to the door, and the discipline takes care of the rest. The key is not to let the ego stand in the way of progress. I came to find out over years and several teachers that all Tai Chi is not the same, nor is it of equal benefit in terms of health. I had novice teachers that did not know much about it and famous teachers that were interested in teaching it as a martial art. I now have a teacher for the past 7 years that truly believes the ultimate purpose of Tai Chi is "longevity while living in the springtime of one's life", I believe that as well. I am 63, he is 76, his teacher lived to be 101, dying in 2005. I feel the greatest benefit has been the vigor and zest for life that the Tai Chi has bestowed. I very, very rarely get sick, and when I do, my recuperative powers are excellent. I teach people that are decades younger than me, some of them have been famous martial artists in their own right. It is a fair deal, it gives back what one puts into it. I suppose the largest negatives are what I have seen in terms of both teachers and students. In terms of teachers, I see teachers who teach from what I call a "new age" point of view, they see Tai Chi as some sort of spiritual panacea. I see students who want to learn from that same point of view. The common denominator is they believe Tai Chi can be learned in a weekend or a couple of weeks without the discipline of long study of the Tai Chi Form. I think this negative is directly proportional to the amount of misinformation promulgated by the popular media. This is what I call half-assed Tai Chi. I once had a student arrive at my studio as I was closing the door. He promptly said, "can't you stay open for awhile and can't I just half-assed learn it"? One of my students said very succinctly: "That's the problem with the world, everyone wants to do things half-assed". I hope that those who take my classes will come away with not only some appreciation for the discipline and work that it entails. But, I also hope they will come away with an appreciation for what the discipline and work can offer. That however, is merely my fantasy. Fact is 99% of students who start it will not experience the very long cycle of learning that leads to its eventual excellent consequences. Seeing Tai Chi as a panacea without seeing what it really entails in order to do it is, as my teacher says, called "being a frog in the bottom of a well". All the frog can do is croak to anyone who will listen "how big the sky is". In other words a myopic view or perspective on things. Most of why they don't continue is not really what they tell me or even don't tell me regarding their departure. I have been doing this too long to believe such fiction. Many people don't stick around long enough to break through ego and habits that are as hard as concrete. As Tai Chi Master H.H. Lui said: "Things in this universe endure because they are selfless". I have students now who I have great hopes for. My hopes are they will come to understand that doing service and justice to Tai Chi is the key to getting the benefit. I hope that some will become teachers, themselves. Passing on to their students, that being selfless entails understanding finally that practicing it is its own reward, enjoying the practice and not continuing to look for "pie in the sky". My own teacher, Master Stephen Hwa, started study with many other students in 1974, among them were numerous Ph.D. engineers from Xerox. He is the only one that continued study and that for over 30 years, one teacher...one student...30 years. My teacher's teacher was Grandmaster Yang Wabiu and he was the personal student of Great Grandmaster Wu Chien Chuan...Wu was an officer in the palace guard of the Chinese emperor. His father had the same job.